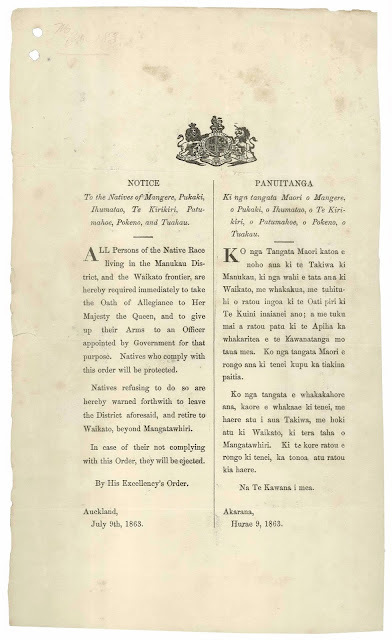 All persons of the native race living in the Manukau district and the Waikato frontier are hereby required immediately to take the oath of allegiance to Her Majesty the Queen, and to give up their arms to an officer appointed by Government for that purpose. Natives who comply with this order will be protected. Natives refusing to do so are hereby warned forthwith to leave the district aforesaid, and retire to Waikato beyond Mangatawhiri. In case of their not complying with this order they will be ejected. 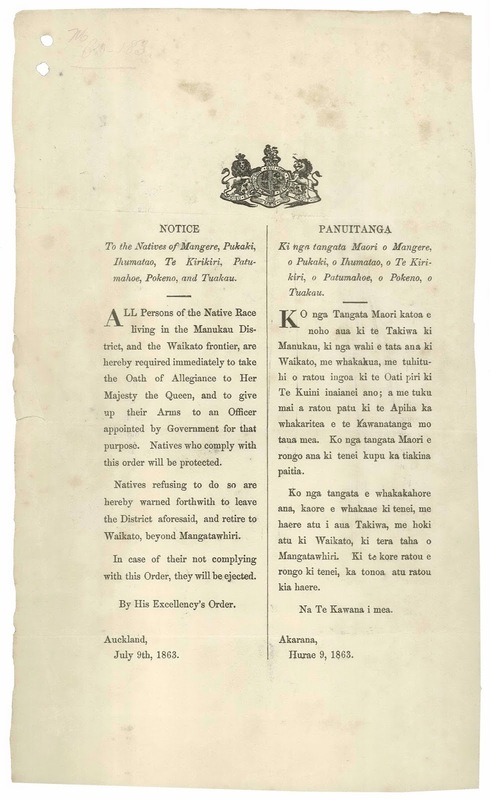 On the same date magistrates were despatched to the various settlements to deliver the notice and demand that Māori take an oath of allegiance to Queen Victoria or leave. As discussed in The Great War for New Zealand (and also in a 2013 article in the New Zealand Journal of History: ‘Choosing Peace or War: The 1863 Invasion of Waikato’) few took the oath. Many of those to whom it was read feared they might be forced to fight against their own kin in the Waikato if they did so. Others read it ‘a positive order to leave’. The overwhelming response was one of bewilderment. They were Maories and relatives of Potatau. Underlings of the Native Office were despatched in haste to call upon them to give up their weapons and take the oath of allegiance to the Queen, or, in default, to retire beyond Mangatawhiri under pain of ejection. The first native to whom this cruel decree was made known was Tamati Ngapora, the uncle of the Maori King, who lived at Mangere, in European fashion, receiving a large income from letting his lands as grazing grounds to the neighbouring farmers. After a short silence, Tamati asked — “Is the day of reaping, then, at hand?” Being told that it was, he observed — “Why has not the Governor put Waikato on her trial, before stretching forth the strong hand?” Tamati and the other Mangere natives quite understood the alternatives. They must submit to what they regarded as an ignominious test, or lose the whole of their property. And yet, to their honour be it said, they did not hesitate for a moment. They all thanked the Pakeha for this last act of kindness in giving them timely warning of the evil that was to come upon Waikato, and an opportunity of themselves escaping; but they could not forget that they were part of Waikato, and they must go and die with their fathers and friends...All the old people showed the most intense grief at leaving a place where they had so long lived in peace and happiness, but they resolutely tore themselves away. And so hundreds of Māori living at Māngere and elsewhere gathered up what belongings they could carry and trudged south to join their relatives in the Waikato. The invasion began three days later. The Tainui communities of South Auckland saw their lands confiscated, their property looted or destroyed and their once flourishing economy destroyed almost literally overnight. In 1927 the Royal Commission into Confiscated Lands (known as the Sim Commission) concluded with respect to the Tainui communities of South Auckland that ‘a grave injustice was done to the Natives in question by forcing them into the position of rebels, and afterwards confiscating their lands’. Nearly sixty years later the Waitangi Tribunal reached a similar conclusion in its 1985 Manukau Report. I spoke about the impact of the Waikato War on Māori in the South Auckland region at a public talk at the Mangere Bridge School last month. Meanwhile, marking the 154th anniversary of these events, a group of people are marching from South Auckland to the Mangatāwhiri River, depositing alternative plaques commemorating this history along the way.